During the cooking portion of the evening Monte was ably helped by Dorothy with pizza service as his regular helper was away. A big thanks to Dorothy. Everyone was to the better for it. In the second set Bill put the finger to the trigger – among other things - to squeeze out a first place finish just three tenths of a ap ahead of Monte with Jeff holding third. Next up, the April Race at Dorothy and Terry’s hammer Time Speedway in Portland. It’s sure to be a fun night with the HO cars so make your plans to come join us. Slot.It Porsches were the battle cars for the second set. Fast, smooth and quiet. Excellent race cars. And surprise, surprise – taking his first NASTE win was Mitch Brooks. Congratulations Mitch! Back about half a lap, Terry Abbott claimed second, with Al in third another half lap back. For the third and final set Al brought out a NASTE favorite – Parma WOMPS. The WOMPS always bring a smile. They circle the track like a small pack of angry bees. Tightly packed angry bees. Taking first place in the bee herding derby was Jeff Fields who was fit to be tied… by Monte. Both tallied 71.9 laps. Just about one lap back was another tie for third between Terry and Mitch. As stated, close racing all night long. When the final totals were tallied, guess what – a tie – for first place. This time between Al and Monte. Great driving gentlemen! Terry took third with newcomer Zach Morgan – a force to be reckoned with – taking fourth just ahead of Jeff and Mitch with a mere three tenths separating the three of them. A special thanks to our hosting team of Al, Donna and Chris for keeping us well fed and entertained. It seemed like every time I looked up there’d be Donna or Chris coming through with another dish. Thank you, ladies! Next up, the March Race at Monte and Victoria’s Penguin Point track in Hillsboro. It’s sure to be a fun night, make your plans to join us. Monte says the Moon Rover and the pink pig will both be on display. We’ll see you there. Time for a little bench racing and some driver refueling courtesy of Stan’s great Chili. We eventually resumed with the second set. This time it was Tracy putting down the hot laps to take the win with Monte in second and Al just a tenth behind. But would it be enough to overtake the Smooth one? Close but no cigar! When the final totals were announced, Monte had held onto first by less than half a lap over Tracy with Al claiming third. Victoria took the win in D2. A special thanks to Stan for hosting and keeping us well fed and entertained. Next up, the February Race at Al’s track in Portland. It’s sure to be a fun night, make your plans to join us. 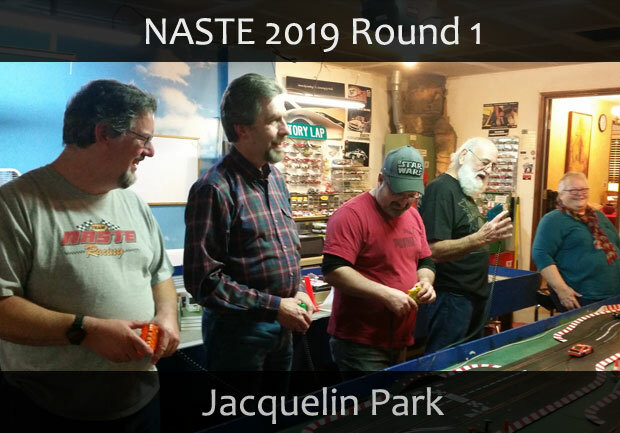 The NASTE Second Saturday Series for 2019 kicked off with a fun evening of entertainment at Monte and Victoria’s Jacquelin Park Speedway in Hillsboro. The Jaq is a 60’ Carrera Digital track that can race up to 6 cars at once on its smooth flowing 2 lane layout. Racers have to adjust to the fact that other cars will be in their lane – all the time. It’s a different kind of beast. The race was broken up into three sections with the lap totals from each section added together for a grand total. For the first section vintage sports cars took to the track in a classic battle – Porsche 904’s and Cobra’s. The second section brought out something new – SCX NASCAR’s! Converted to Carrera Digital and with the magnets firmly in place the COT’s ripped around the track with a fury. Per Victoria, we were not using the fuel settings so no trips to the pits, just flat out racing. For the final section, the lights went out, and in the distance the 1:24 Carrera Cheetah’s could be heard starting to growl. It’s always fun to race in real darkness and the Cheetah’s brought just the right touch to the final heats. When the final counts were made Terry Abbot finished first with Tracy Flood and Al Christensen tied for second. A special thanks to Victoria for having pizza at the ready and to all the rest that brought snacks to share. Next up, the January Race at Stan’s track in Newburg. It’s sure to be a fun night, make your plans to join us. 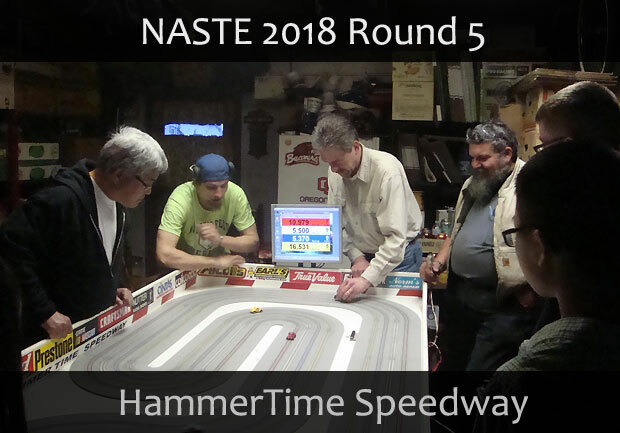 The NASTE IROC Drivers Championship for 2018 continues on with rounds 6 and 7. 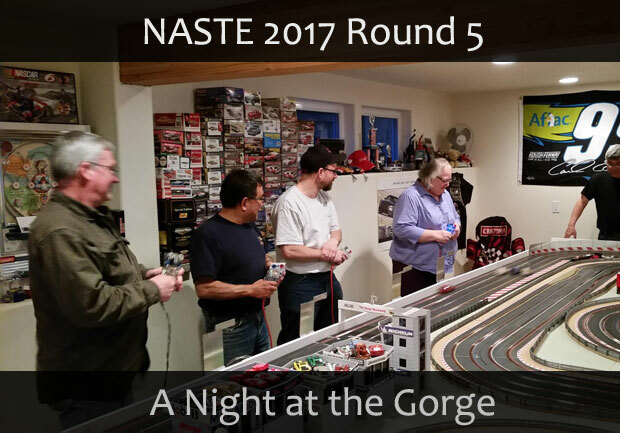 In early May we convened at Bob Nakamura’s Gorge Raceway in Troutdale to again do battle on his large 4-lane Scalextric layout. 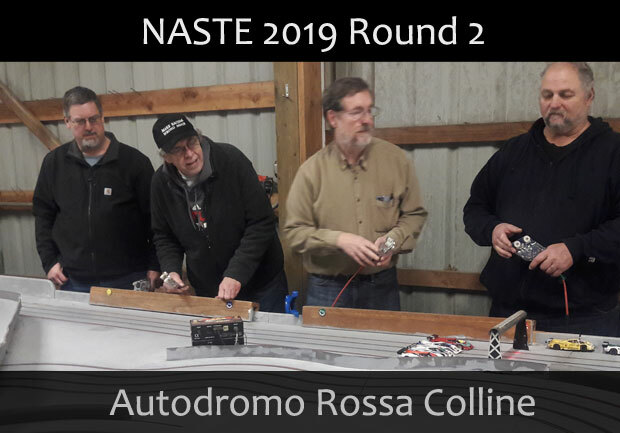 And once loosed, the NASTE drivers provided a thrilling race in the first set with Terry Abbot taking first with Bob Nakamura second and Monte Saager third – all separated by only 1/10 of a lap! In the second set Bob led the way with a one lap lead over Monte in second with Tracy flood just a couple of tenths back in third. A short month later and it was racing at Howie’s Rapid Raceway in Portland. Howie’s track is an old-style 4-lane wood track and we’ve always enjoyed racing there. However, tonight would prove troublesome at best. The track had been cleaned recently and the result was that even at 9.5 volts the tires were glazing over. Perhaps it was the tire compounds, but quickly after starting the race a car would become undriveable, sliding side to side and in some cases impossible to get up an incline. Racing for some and disaster for others. It was decided to limit the second race to only three lanes. Nevertheless, making the best of the night – taking first in the opener was Tracy Flood, followed by Terry Abbott in second with Dorothy Abbott in third. In the second set the win went to Monte Saager followed by Al Christensen in second and Terry Abbott in third. I think we learned that next time we should not only consider some test time but we should also set up some cars specifically for Howie’s track. Next up – a July date at Autumn Hills in Milwaukie. 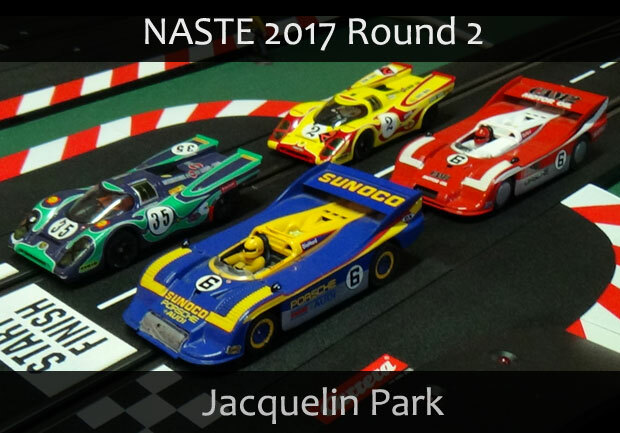 The NASTE IROC Drivers Championship for 2018 continues on with round 5. It was another night of short track racing under the lights at HammerTime Speedway. 16 drivers did their best to negotiate the turns and the turn marshals thumbs. Of course, good food had to be handled, too. The first heat featured "gasser" type cars in honor of the track owner's new toy in the driveway. Henry J race cars never saw many turns but these handled it just fine. At the end it was Tracy on top with Terry in second and a tie between Al and Dana for third. The second heat brought out the modified track cars that are fun and fast, at least they seem fast for t-jets. The track owner showed everyone the fast way around the track to secure a victory. Dana took the second position and Tracy rounded out the podium. It was a night of great laughs, great food and great friends. Russell Flood brought his new wife and her cousin and they both drove the cars very well for newbies. There were a lot of requests for them so the next race here in September will see the Isetta racers get back on the track. The next event is scheduled for the big 1:32 track at the Gorge Raceway in Troutdale on May 12th. Come join us. 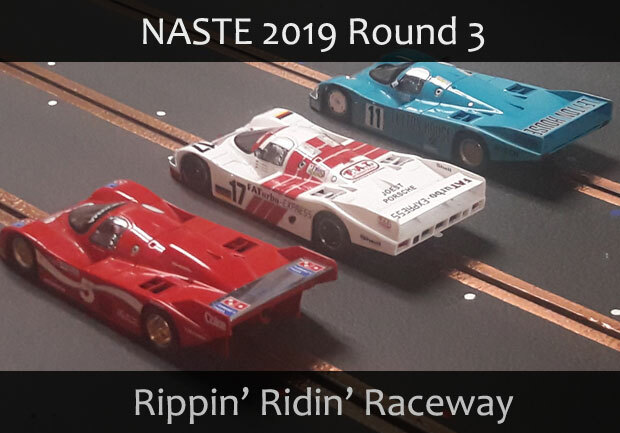 The NASTE IROC Drivers Championship for 2018 continues on with rounds 3 and 4. Round three was held on the second Saturday of February in Hillsboro at Monte and Victoria’s Jacquelin Park Speedway. The ‘Jaq’ is a Carrera Digital track system that requires drivers to use improved techniques in driving since there will always be cars in your lane and the competition always gets, well, a little silly. To make sure that drivers had to make pit stops part of their strategy, heats were set for 10 minutes. Taking top honors was Terry Abbott, followed closely by Monte Saager with Dan Fritz taking third. Round four returned us to Al’s Rippin’ Ridin’ raceway in Portland. In the opening round featuring once again, Slot.it Group C cars Monte took the field to task followed by Terry with our host Al in third. For the second set Al again brought out the womps. Everyone enjoys the womps! And at the conclusion it was the Hillsboro Hot Shot again followed closely by Terry with Tracy Flood taking third. The next event is scheduled for the HO track at HammerTime Speedway in Portland on April 14th. Come join us. 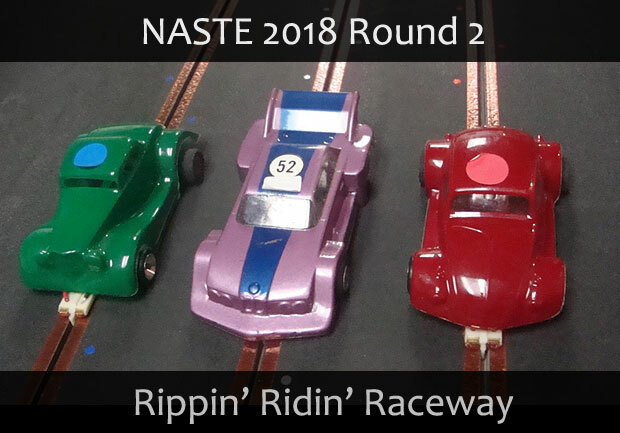 The NASTE IROC Drivers Championship for 2018 is underway! The first event was held the second Saturday of December in Hillsboro at Monte and Victoria’s Penguin Point Raceway. Competition was close through two exciting heats of racing action. The opening set was Slot.It Group C cars with the second set being those treacherous Ninco Stratos! And surprise, surprise, the winner was not the track owner but Terry Abbott who took both opening rounds to take the early points lead. Next up was a trip to Al’s Rippin’ Ridin’ raceway in Portland. 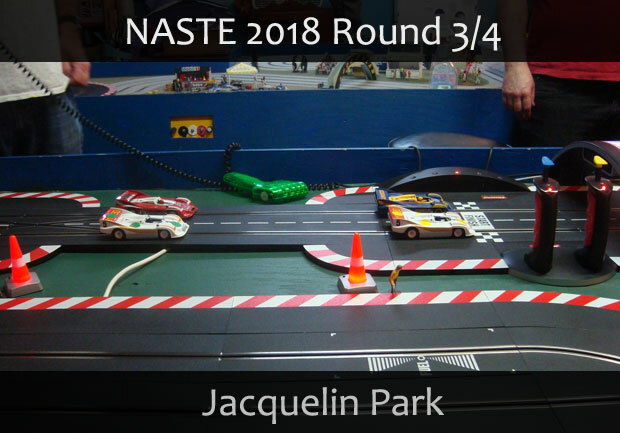 As this is now the main stop on the NASTE Odd Thursday schedule racers are well acquainted with the track. And they took to it with great delight. In the opening round featuring once again, Slot.it Group C cars there was a first place tie as Jeff Fields and Monte Saager both totaled the same amount of laps. For the second set Al brought out the womps. Fast and furious, they also bring out the smiles. We liken them to a horde of angry bees circling the track. And that’s after the voltage is turned down! And at the conclusion it was the Hillsboro Hot Shot in first followed closely by Terry. The next event is scheduled for the Digital track at Jacquelin Park in Hillsboro on February 10th. Come join us. 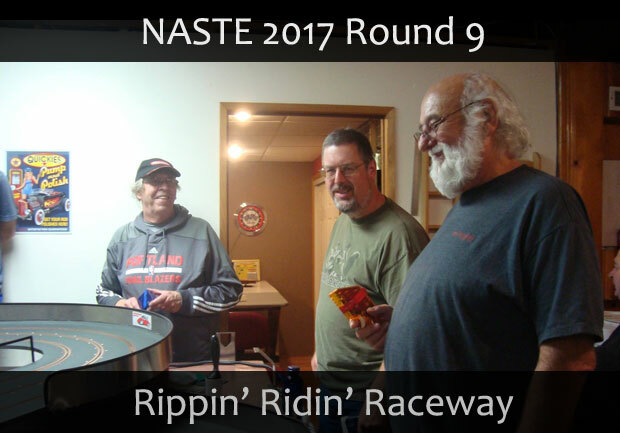 The NASTE Second Saturday Series for 2017 concluded with a great evening of entertainment at Al’s Rippin’ Ridin’ raceway in Portland. 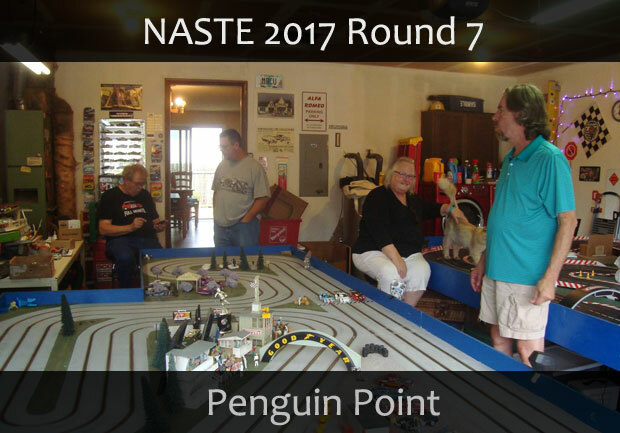 Al’s track is one of the regular stops on the NASTE Thursday schedule, so racers were well acquainted with the circuit. It’s a smooth, flowing track where good skills can get you a good result. Eleven racers took to the start line for the nights first event featuring three of Al’s Sportsman cars. These are very cool, old-school cars. They can be a little tippy, sometimes a little short of brakes. Rather fun and exciting. Putting the foot to the floor it was Monte in first, with Terry in second just ahead of our host Al in third. The nights second race brought out the speed buggies – the VW Womps. Fast and furious, they circle the track like a bunch of angry bees. We like them a lot. Liking them the most was Terry, taking first with more than a lap lead on Monte in second, with Al just squeezing ahead of Mitch for third. Of special note was the return of serviceman Russell Flood. Now that he’s stationed in the Tacoma area perhaps we’ll get to see more of him. A special thanks to the upstairs girls Donna and Chris who kept supplying us with a cascade of wonderful treats throughout the evening. And that concludes our 2017 Second Saturday Season. Thanks to the track host and participants. Next up, the Halloween Race at Howie’s Rapid Raceway and then it’s on to next season. Make your plans to join us. 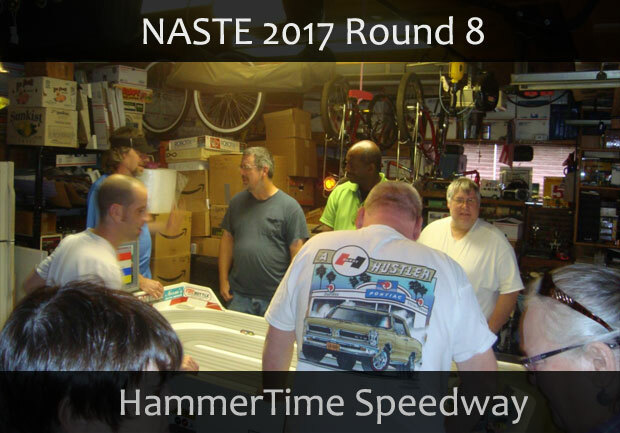 The NASTE Second Saturday Series returned to Portland on Saturday, September 9th at Hammer Time Speedway courtesy of Dorothy and Terry Abbott. The ‘Speedway’ is a small, tight HO layout that though simple in design maintains a great amount of danger at most every turn. A clean run is a matter of skill with a pant full of luck thrown in for good measure. With a large field of sixteen racers in attendance the battle began with some of Terry’s dune buggies. Looked more like we should be driving to the beach with a surfboard than racing. But racing we were. Amid the collisions that gives the track the look of a parking lot everyone wants to exit. Taking the checkered flag amid the mayhem was our host, Terry, followed by Tracy Flood in second and Anthony Schoepflin in third. For the second set Terry pulled out one of the crowd favorites, the dirt track racers. Great little cars that really look the part. They may be a little more predictable than the buggies but just as fun. The action on the track resembled a Chrysler festival as we dodged and we darted trying to stay out of trouble. And once again taking top honors was our host Terry, followed by Anthony in second with Monte Saager sneaking past Tracy into third. At the table during, in between, and after we were treated to a fabulous spread of goodies courtesy of Dorothy. From things I didn’t recognize to familiar favorites, it was all good. We’ll see you at Al’s for the final event of the season. 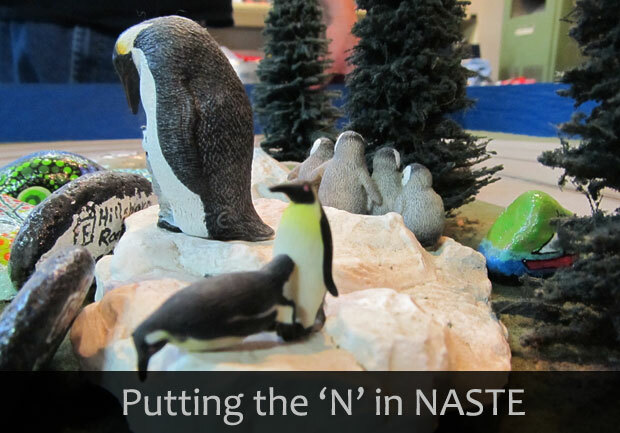 The NASTE Second Saturday Series invaded Hillsboro on Saturday, August 12th. The Penguin Point track is a 50+ foot analog track. With some tight turns the accent is more on handling than all-out speed. For tonight’s battle Monte had set out a set of Ninco GT’s for the opening salvo. With small numbers in attendance Kleo Kitty came looking for track time and almost got some. Eyeing the table he leaped into the air landing square upon the racing surface like a fur-footed Godzilla. As luck would have it no cars were eaten, clawed, or otherwise damaged in his dynamic and dastardly display of cat-fury. This would be the most ferocious event of the day. For the second round, some of the highest priced cars to grace the NASTE stage were set out – NSR Porsche 997 GT’s. As in the first set, drivers drove, marshals marshalled and finishers finished but at a little more rapid rate. There were no further reported incidents of cat-mayhem. At the conclusion results were announced and participants were sent off into the night packing pizzas. Thanks to all for coming and a special thanks to Victoria for her dedication to food preparation. 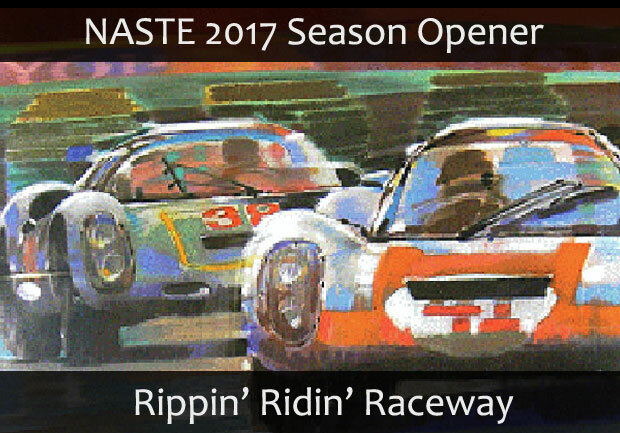 After some delay the long awaited second race of the new NASTE Second Saturday Series finally arrived in Hillsboro on Saturday, June 10th. The Jacquelin Park track is a 50+ foot Carrera Digital track. Digital racing allows for multiple cars in the same lane. It can become quite intense and sometimes quite silly. Finding the balance is sometimes important but it’s not always easy. For tonight’s slug fest Monte had set out a set of classic Porsches – a pair of 917K coupes and a pair of 917-10 open cars. The coupes were fast and tricky, the open cars felt more stable but since it’s IROC you get to race them all in turn. The racing would be the standard local Saturday night fare – qualifiers with mains. Monte’s idea. However, there would be no fuel – Victoria’s idea. Each driver would drive each car in a series of 25 lap qualifying heats. At the conclusion drivers would be ranked by lap total with the lower four drivers running a 35 lap B Main. The winner would be bumped up into the A Main with the remaining three drivers. In each Main, the higher ranked driver would get choice of cars. In the Qualifiers Monte blitzed the field for a perfect 100 laps. Tracy was just behind with 99 and Terry totaled 97. In the B Main Al managed to sneak by Todd for the victory earning a spot in the final. In the A Main it was a tight battle with Monte out front for much of the early going only to be passed by Tracy during an off-track excursion. A few laps later Tracy found the offs handing the lead back while Terry slipped into second. And with time running out that’s how it would finish. Another scheduled date, another actual race! On Saturday, May 13th 10 hearty racers were treated to food, fun and frolic. As for the hearty part – torrential rains made the trip to the start quite interesting with lakes appearing in the middle of intersections. We forded a few on route. Once there food caught your eye on the way to the track. It was excellent as always. Kelly never fails to disappoint. Some very tasty pizza gave way to a selection of great cookies. I felt guilty taking the last of the chocolate chips but when I returned later, more had magically appeared! I did the only thing I could and had another one. On the track, more magic. For starters Autumn Hills is a beautifully detailed but somewhat tight circuit that will keep you on your toes. Keep the car moving at speed and you’ll do well, scrub a little off on the bridges here and there, not so much. But to be sure there’s no time to rest. Up first, Rico “prepared” a pair of Fly Porsches. They were fun. I really enjoyed them. Felt like I was going fast. But it was an early heat and soon I could see that I was not going to be on the fast end. In a stunning result Tracy Flood claimed his first NASTE victory scorching the Hills for a 46.1 lap total – two tenths of a lap ahead of Rico, with Mitch Brooks in third a full lap and a half off the pace. The rest of us, not so much in fact my magical disappearing act resulted in a nice 6th place finish. For the second set out came an old crowd favorite – the Ninco Flying Fickle FIATs of Fate! Now are they slow or just misguided? Perhaps a little of both. I was running late in the field this time and maybe it was Dorothy’s chocolate but suddenly the magic worked. The little fickle fiends were responding like lightning bolts. Ok, maybe more like 30 watt bulbs but by the time the race had been run I stood in first scoring 46.7 laps with Terry almost a lap behind in second. Rico claimed third place. For me, finally, it only took that one magic moment. 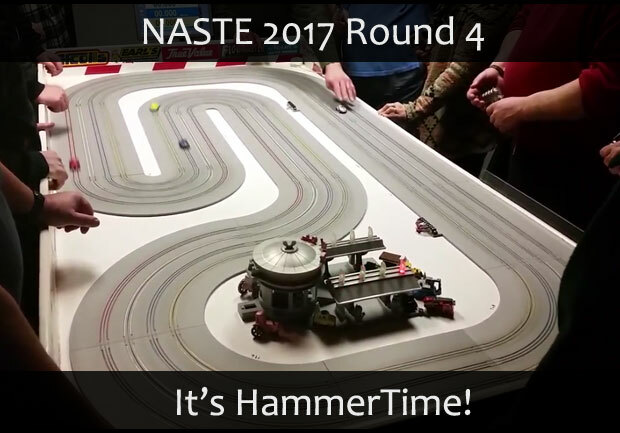 And that’s our story from another great night of NASTE racing. A big thanks to Rico and Kelly for providing an entertaining evening. For the evening the surface seemed more like an ice rink or a backyard slip n’ slide as cars slipped, slid and careened all over the place. It looked more like Saturday night at the Derby! First up for the evening were a blend of GT cars provided by Mitch Brooks. We drove them as fast as possible which means we did our best to manage their progress around the track. Managing the slippery cars the best was Terry Abbott followed closely by Jeff Fields with Monte Saager taking third. Nevertheless, undaunted Jeff Fields stormed to his first NASTE victory followed closely by Terry Abbot with Tracy Flood taking third. And there you have it, another night of great racing. A big thanks to Bob and Terry for inviting us over to play. Next year – more magnets! Sickness and foul weather played havoc with the schedule as both the second and third race had to be postponed for later in the season. 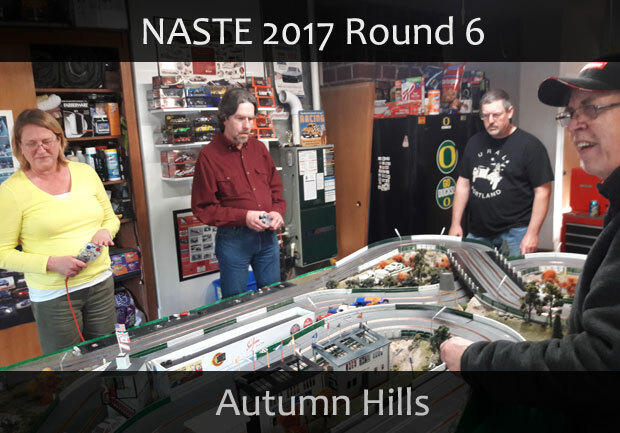 Never the less, on Saturday, March 11 we found ourselves at Dorothy and Terry Abbott’s HammerTime Raceway in Portland for Round 4. And what a round it was! A grid of 16 racers from experienced to beginner came out to give the HO cars a try. Including two racers – Monte and Anthony – just back from three days of HO racing at the Ferndale Fray in California. Would they be able to put that experience to good use? For the first set, the cars chosen were a recent favorite – the Isettas. They’re not only slow but a little on the tippy side too. Makes for a challenging drive. Keeps the marshals busy too. And taking us all to task was Track Master Terry. His 73.7 lap total was a lap and a half ahead of, dare we say it, Monte and Anthony – the Fray boys – tied for second at 72.7 laps. Experience pays off! Back another lap in third was Tracy. Next up – the dirt track racers. These are a bit faster and much more forgiving. Times went down and totals went up noticeably. Squeezing past the field in a dramatic victory was Tracy with 90 laps even. Tied for second just two tenths of a lap behind were Terry and Fray-boy Monte with Fray-boy Anthony in third. It was another night of great racing and thanks to Dorothy for a table of delights. And thanks to Terry for giving us a place to play. 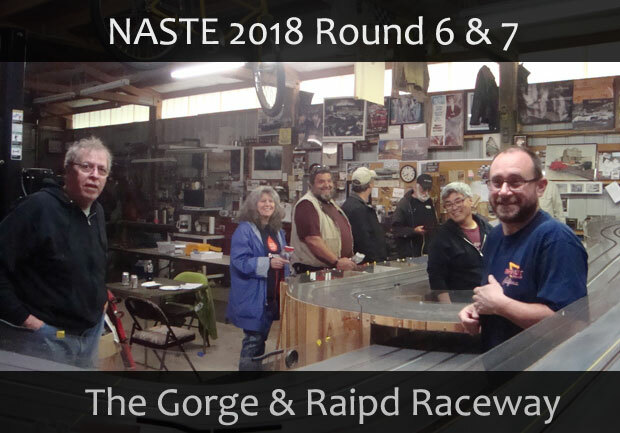 The new NASTE Second Saturday Series opened with a race night at Al’s Rippin’ Ridin’ Raceway in Portland. A field of eleven racers answered the bell and took to the track for two heats featuring different sets of Womp cars. As drivers got the handle of the fast, little demons, lap times fell and lap totals increased. Taking the checkered flag in the first set was our host Al with 63 laps followed closely by Monte with 62.6 and Dan Fritz in third with 61 laps. It was a great race and we would like to thank the ladies for a variety of great treats. And thanks for Al for hosting – it’s a great place to play.